Weighed in this morning at 150 pounds, no change from yesterday. Cool, that marks the third straight day I weighed in at my target weight. And yesterday was not a diet day, technically. I actually stayed on my diet regimen throughout the morning and afternoon, but went to the local tavern to hang out with friends in the evening. I had two glasses of beer and a chicken waldorf salad. Now you might say that that's hardly breaking a diet, and perhaps you'd be right. But technically, I allowed myself to partake in the revelry, and I did, yet somehow managed to eat better and drink fewer beers. And when he tweeted it, several of his readers retweeted it, and it grew some legs over the Twitterverse. 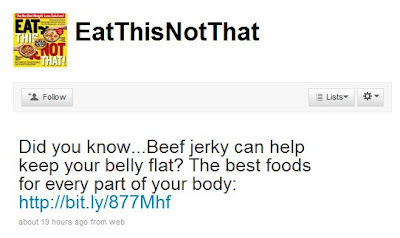 The URL in the tweet takes you to an article entitled, "Best Foods for Every Part of Your Body". Interestingly, the article does not even mention beef jerky, but does mention beef. I thought it was a cool tweet, because David has earned a lot of credibility as a weight-loss and diet guru, and with that one tweet he validated my entire blog! Well, I don't see any signs of fat people running out to the grocery store to buy up gobs of beef jerky. But maybe I should give it more time!